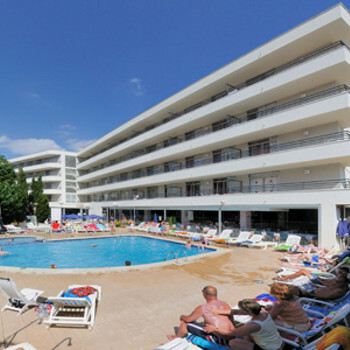 Part of the Med Playa chain, the Aparthotel Esmeraldas is a large property on the residential outskirts of Tossa de Mar. Tossa\'s sand and shingle beach is within walking distance and the hotel has its own pool with a separate section for children. These apartments were very clean and well furnished, with kettle, microwave, telly with BBC1, ITV3 & Sky news. The bedroom and living areas were a nice size and had new throws on beds and new curtains, it looked like it had been recently painted. We stayed on the 4th floor at the back of the hotel, we had a view of the pool and could see the flats opposite which were a bit tatty but didn't spoil holiday as were out most of the day. There was a barking dog in the flats which was a bit of a pain. The appartments are well situated with 5 minute walk to bars etc. On Thursdays there is a market at the bottom of the road. There are 2 supermarkets within a couple of minutes walk, both seemed very reasonable for prices. There wasn't a lot to do in Tossa of a night and because of children running around in bar area of hotel we didn't see any entertainment. We were bed and breakfast, nice food and hot and quite a big choice. I would go back here if I was going back to Tossa. A nice hotel with friendly staff which is very clean. This hotel was very clean and the staff were very freindly and helpful. We were self catering but chose to eat in the hotel as the food was excellent. Would definately recommend upgrading to half board on arrival. Great for families, the entertainment at night was good too. Hotel was clean and staff very friendly. Can't believe it is only classed as 2 star. Apartment was adequate for 4 adults and food that we did eat at hotel was very good and plentiful. Nothing was too much trouble. Pool area and public areas clean and well looked after. Great showers and loads of hot water. We booked this 3 day trip with another couple and were wary as the price was so cheap, but as we were only there for 3 days thought it worth a try. However, we were pleasantly surprised. The apartment was clean and comfortable and whole hotel was kept spotless by very friendly staff. As we were unsure of the size of 1 bed apartments we booked one each but would have been just as happy had we shared. The lounge had twin beds which doubled as sofas and one had a further pull out bed underneath. There is a fridge, 2 ring hob, microwave, kettle and toaster. We were b&b and breakfast was a good selection of hot and cold, fruit, cereals etc. The only downside is there are no views to speak of from the apartments. Saying that, it's only a short walk into the town which has pretty rocky coves with small beaches and loads of restaurants and little shops. There is a good supermarket just around the corner if you are on a budget. Just returned from a one week stay at these apartments and were pleasantly surprised after reading some of the reviews. Apartments spacious and spotlessly clean (as was all of the complex, especially around the pool area). Air-conditioning which was an added bonus. Plenty of storage space, with extra drawers under the sofa beds. Plenty of hot water and very powerful shower. Nice size balcony complete with free standing clothes horse to dry any washing. You could also arrive at the pool area at midday and not struggle to find a sunbed or parasol. Entertainment in the day (water polo, table tennis, darts, etc) ran by Fernando who is excellent with the children and adults alike. Entertainment in the evening very good too, again Fernando puts everything into his entertaining and is a really lovely and genuine guy. You can tell he enjoys what he does. While we were there, his mum visited and she too, is a lovely lady. Make sure you ask him to say 'Cheers Mate'!!! The bar closed at midnight. So come 12.30 am, all was peaceful, no gangs of teenages running around the complex and up and down the lift. Have come to the conclusion that only ever having stayed in 4* accommodation in the past, this does not always mean you are getting a better standard of accommodation or holiday makers! All the staff are really helpful and friendly, especially the receptionists and bar staff. Would definitely return. Just cannot believe it only has a 2* Rating. We stayed here just for 3 nights, and that was enough. I wouldnt like to stay for any longer than that as there was not enough room for 3 people in the studio that we stayed in. It was clean but very basic, the third bed was a pull out bed and ended up right next to the fridge. The balcony was very small for 3 people to sit comfortably on and the view was awful - private apartments opposite, which were very run down to say the least. The entertainment was absolutely rubbish, they may as well not have bothered. The location was fine, just a short walk to the town. We booked this holiday as our first family holiday with our 4 year old and 1 year old. We weren't sure what to expect, holiday brochure depicts this hotel as a basic 2 star property and we were very surprised on arrival. We were allocated a studio apartment on the ground floor on a quiet wing overlooking the kiddies playground and we weren't disappointed. The room was basic in decor but contained all the facilities needed. Very surprised that the room had air conditioning... added bonus. The room had 2 twin beds pushed together to make a twin, a pull out roll away bed and a cot for the little one. Another added bonus was satellite TV in the room, BBC1, ITV3 and Sky News from the UK plus Spanish channels. Great for plonking the kids in front of when they wake early in the morning. Also equipped with bath & shower. 2 ring electric cooker, kettle, toaster and microwave. We only ate once in the hotel, the first morning when we had the buffet breakfast, very reasonably priced and well stocked. The hotel was very clean, the staff amazing. Everyone was very approachable, professional and friendly. The faciltities are good, good family pool, games room, table tennis table, small kiddies play area and also an entertainments bar with the wonderful entertainments guy Fernado. If you go, make sure that you check our Fernando and Claudia (receptionist) show! It was fab and very funny. When we arrived at the Hotel the staff on reception was very friendly and check in was no problem. When we got to our rooms they are very very basic but clean. The shower was very powerful and never lost its power. Hot water all the time. The entertainment was no that good unless you were a child same songs sang every night. Beer prices competitive. As we were self catering we ate out every night and all I can say is get yourself to Pano's resturant as Tony and Terese are very friendly and do great breakfast's for 4 euro's and that includes your tea or coffee and juice. As for Tossa De Mar itself there is really nothing for you to do. It is very quiet. We went in to Llorett a couple days and that is where all your main shops are. We would not got back ourselves as it was a bit quiet but we did enjoy it. All in all the Hotel was very clean. The satff are very friendly. the Pool is very small though. Rooms are really basic. Judge for yourselfs as some people rave it about it. But all i can say it was a releaxing break but the kids did get bored some of the time. We have stayed at the Esmeralda's at least 7 times now and it just gets better. The hotel location is first class, only a short walk to the sea front. The hotel and the rooms are spotless, the maids are absolute diamonds, they work hard and are very good. The bar staff are amazing, goodness knows when they sleep but they are always immaculate and efficient, plus the drinks bill is the same every time. We would recommend this hotel to any one as long as you are prepared to venture into the lovely town of Tossa de Mar itself, Tossa has to be just about the most beautiful resort on the Costa Brava. We are going again in 2006.